Despite what felt like a recovery yesterday I am still very much battling a cold. It's really a shallow dry cough that I am finding most annoying. I ended up getting about four hours sleep last night so my morning has been a series of short naps that I'm hoping will get me through the rest of the day. In a strange way I blame my conditioning for the way this cold is playing out. It's like my immune system is refusing to give into illness and, consequently, I've remained in this stasis of mild symptoms over the past three days. I actually feel strong enough to run, as I did yesterday, but I'm going to hold off on that until later. If I'm noticing improvement later I may try a workout of some type. I'm a firm believer in powering though colds while respecting fevers. I've finished McDougall's "Born to Run" and I recommend it to anyone who has an interest in physiology, anthropology, native North American culture, adventure, nutrition and (of course) running technique. 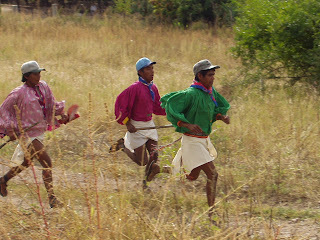 The book features many interesting people (US ultrarunners and native Tarahumarans) with fascinating stories. The main focus of the book is on how these amazing people gathered together in a dangerous and obscure part of Mexico's Copper Canyons for a unique and incredible 50 mile race. I cannot recall any book I've read in recent years that interested me like this one. I'm anxious to get out and run if makes sense to do it later. The focus I've given to front/midfoot striking, upright form and higher cadence has been an interesting experiment that I hope will lead to a successful re-engineering of my running style. A point made often in the book is "If it feels like work, you're working too hard." I believe there's something to that. Hope you battle your cold. I have one now as I type this. Last week, and this week I am taking it easy. Next week comes the storm again full force. Today, though, I will work on some core training. Thanks for the book review, I will have to check it out. Good luck with your running experiment. Have a good one and Happy Holidays.